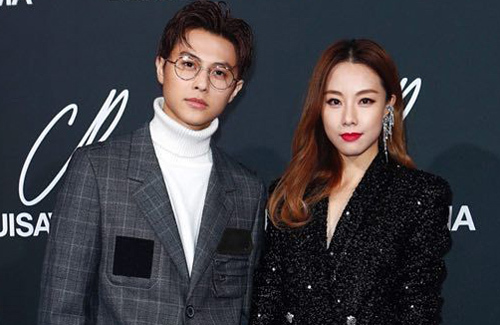 Wedding bells may be ringing soon for Stephy Tang (鄧麗欣) and Prince Chiu (邱勝翊), as she prepares to put down roots in Taiwan. Last October, she invested in a bubble tea store in Taipei, which provided her an excuse to visit Taiwan regularly to manage her business and meet up with Prince. Recently, seeking to open her second store in Prince’s home district, Stephy has been frequently flying to Taiwan and was spotted looking at homes to buy. Dating for almost a year, the pair has been showing off their sweet interactions on Instagram. This is a marked change for Stephy, who previously kept a low-profile relationship with Alex Fong (方力申). An insider source reveals that since dating Prince, Stephy had been experiencing the feeling of first love all over again. With Prince’s gentle and romantic personality, he can naturally make any woman feel loved, and Stephy loves this feeling. Last year on Stephy’s birthday, Prince planned a two-day event, in which he invited all her friends to celebrate on the first, and spent the second day on a sweet date together. Wanting to get married soon, Stephy has been receiving help from Kary Ng (吳雨霏), Miki Yeung (楊愛瑾) and Cherie Ying (應采兒). Whenever the friends see Prince, they would ask him to propose to Stephy and have children quickly. @jd33 Stephy is 35 and looks older than her age. She tried to bury her face with tons of makeup, which makes her look even older. She must be getting desperate for marriage nowadays as she is reaching close to 40. They remind me of Demi moore and Ashton Kutcher. Mark my words, this couple will not last, he will dumped her once he had enough fun with her. Little boy and older sister relationship never ends well. Honestly, you do not know for sure if they will last or not. You can not compare them to Demi and Ashton as they had a way bigger age gap. I think it can work if the age gap is not too big. In this case, it is only 5 years so it is not too bad. Did you hear about that Korean actress Ham So Won marrying a guy 18 years younger? His family was so against it and I have the feeling like it is a fanboy marrying his idol just like Kevin Cheng and Grace Chan who also have a big age gap. But since Kevin is the older one, many are more accepting. Plus age is only one of the factors so that alone cannot determine if a couple will last and be happy or not. I must admit that I used to be just like you due to my parents influence. They hate older sister little brother relationships and say that those do not last since guys will want younger girls or girls their age. I am still a bit like that but must say that I am better about that and can accept if the age gap is not too big. Older men and younger women are acceptable for more traditional folks while older women and younger men are opposed. My parents were like that and said it was because men do not age as fast as women which can be true to some extent. In this case, since the age gap is not too big, maybe it can last. However, lasting and being blissful and happy are two different things. Some try to last but are not happy at all. @mihk1994 Lol. You’re being funny if you think because of their age and that she looks older than him and he might dumb her later? What about for Tavia and Him? She’s also 5 years older than Him too and Him had always got the baby face look so how come he haven’t dumb her yet? Why haven’t divorced either but still happily married? Not all guys are equal the same way right? Maybe there are exceptions? Like Catherine Hung Yan and Andy Zhang whose age gap is 10 years? Exceptions is one thing, but it depends on the couple. Alyssa Jia and her husband are 9 years apart and she is the one who is older. They are very happy and blissful and have 2 daughters together too. Alyssa was once married with a daughter from her first marriage too mad her current husband accepts and loves her just like his own. Age gap is just one of the factors but should be be the deciding factor about whether a couple lasts or not. Never heard of Prince Chiu and don’t follow his news.. but looking at his various photos with Stephy, they just don’t look at ease and don’t look like a matching couple. They give me the feeling that they are just posing for a pic, it’s not natural. Whereas the photos of Alex and Stephy were always more natural looking. My question is – are they REALLY dating or is this publicity? @moseenaddict They wont last long, give them a few years max. Hope they don’t get marry and have kids, imagine the kids going to school and telling their classmates my daddy is Prince. The guy’s parents’ play a joke on him for life. Taiwanese, Hongkongese, Vietnamese, and so on, why make up names that will bring harassment & embarrassment to your children for life. Harry Shum Jr said it best, life is simple, people make it difficult. Also, you can tell she put on tons of makeup. Let us see your real face without makeup. Don’t worry, Halloween isn’t until the end of the year.